In the twenty-ninth novel in the New York Times bestselling Karp-Ciampi series featuring “the best fictional prosecuting attorney in literature” (Mark Lane, #1 New York Times bestselling author), Butch Karp and his wife Marlene Ciampi must stop a radical organization of armed militants bent on the cold-blooded murder of uniformed on-duty police officers. 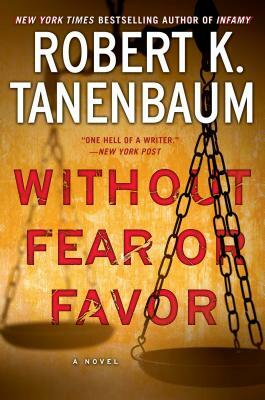 Full of Tanenbaum’s signature page turning intense action and heart pounding suspense from “one hell of a writer” (New York Post), Without Fear or Favor will keep you guessing until the final scene. "This story has a lot to like...Karp is rock-solid as both prosecutor and as person...The pace is fast, the courtroom scenes make you feel like you're there, and the ending satisfies...This is an enjoyable tale of good vs. evil and the importance of knowing who you are." "This is one of the better recent Karp thrillers; it's tightly written and plotted, and the author seems to have rediscovered his passion for his characters...[Trap] signals a definite return to form." "Those outraged by how the government handled the 2012 debacle in Benghazi will find a lot to like."